The effect of clustering behaviour on metabolism, body temperature, thermal conductance and evaporative water loss was investigated in speckled mousebirds at temperatures between 5 and 36°C. 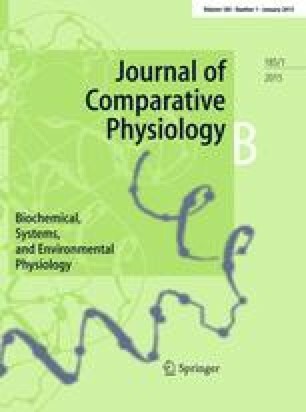 Within the thermal neutral zone (approximately 30–35 °C) basal metabolic rate of clusters of two birds (32.5 J·g-1·h-1) and four birds (28.5 J·g-1·h-1) was significantly lower by about 11% and 22%, respectively, than that of individuals (36.4 J·g-1·h-1). Similarly, below the lower critical temperature, the metabolism of clusters of two and four birds was about 14% and 31% lower, respectively, than for individual birds as a result of significantly lower total thermal conductance in clustered birds. Body temperature ranged from about 36 to 41°C and was positively correlated with ambient temperature in both individuals and clusters, but was less variable in clusters. Total evaporative water loss was similar in individuals and clusters and averaged 5–6% of body weight per day below 30°C in individuals and below 25°C in clusters. Above these temperatures total evaporative water loss increased and mousebirds could dissipate between 80 and 90% of their metabolic heat production at ambient temperatures between 36 and 39°C. Mousebirds not only clustered to sleep between sunset and sunrise but were also observed to cluster during the day, even at high ambient temperature. Whereas clustering at night and during cold, wet weather serves a thermoregulatory function, in that it allows the brrds to maintain body temperature at a reduced metabolic cost, clustering during the day is probably related to maintenance of social bonds within the flock.